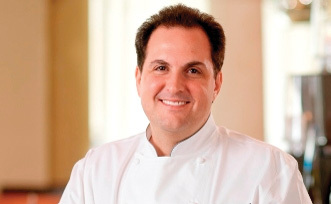 We are honored to open our kitchen to James Beard winning chef Rick Tramonto, who will be preparing an unforgettable five-course dinner..
Tramonto is the former executive chef/partner at the world-renowned, four-star fine dining restaurant Tru in Chicago, and partner in the highly acclaimed Restaurant R'evolution in New Orleans. Now, he's culinary director for the highly successful Tramonto's Steak & Seafood and RT Sushi in Chicago. The menu will be paired with wines from Trefethen Family Vineyards. In attendance will be Hailey Trefethen.